Just caught your first trout and excited to get back to camp and start cooking? 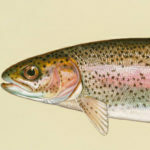 Trout is a light flavor fish that is as easy to cook as it is to catch, as long as you follow our easy instructions and your trout will be ready for cooking in just a few minutes. It is important to act fast as fish can quickly start to decay due to internal bacteria and digestive enzymes, especially in warm weather so make sure to clean and store your lake and rainbow trout quickly if you want to eat them! Lets get started learning how to clean lake and river trout! In order to clean your catch you will need the following items: a sharp filet knife, a clean cutting board and a trashcan. The most important tool is a good filet knife, we recommend the Mercer Culinary Millennia 8-Inch Narrow Fillet Knife for home use and the Kershaw Fillet Knife with Sheath while camping. Both knives a made of steel and come razor sharp, just be careful while packing! Step 1: Lay your trout flat on the cutting board. Step 2: Cut the trouts stomach towards the head, continuing to the head. Make sure your cuts are slow and confident, remember you only get one chance at preparing your trout for dinner! Step 3: Insert the tip of the knife into the gills and cut upwards, removing the head. Step 4: Remove the inner organs and blood with your hands or a spoon. After you have removed the head and entrails make sure to properly dispose of them if you are camping. Leftover fish are tasty treat for for a number of animals, including bears! Step 5: Clean the remaining trout with cold water, removing and blood stuck to ribs or the spine. Try using a hose, or water bottle if you are camping. Cleaning the trout does not take much water but be sure the water is clean and not dirty river water! Step 6: Place your catch flat on the cutting board and insert your knife under the rib, carefully removing them from both sides and the spinal column. Remember, removing bones is not necessary! Trout can be cooked with the bone in and still taste delicious! Sleeping Bag Dirt is a community of camping enthusiasts that loves the outdoors. Our team loves pushing their limits on their adventures. For more info about what we do, read our team profile. © 2016 Sleeping Bag Dirt, All rights Reserved.